The size of groups in the larger mammals is a product of social evolution, habitat features, resource availability and dispersion, seasonality, and levels of human disturbance. It is commonly accepted, for instance, that group size is a trade-off between benefits that may accrue from closer social contact and the efficiency of foraging on a limited resource. The term group here does not necessarily imply relatedness among individuals, but merely the close spatial association of members of a population. Elephant groups at (top) Nagarahole National Park, India, and (bottom) Amboseli National Park, Kenya. Group size in both Asian and African elephants is influenced by season, forage availability, density, social needs, and predation pressure. forage is limited, such as during the dry season. Group size may also be a direct function of random associations of basic societal units, such as mother-offspring. Thus, group size could be positively related to density, which in turn could vary seasonally or across habitat types. Finally, human disturbance in the form of poaching could bring elephants together into larger groups for protection. Data from across the elephant's range in the two continents show that several of these factors interact in determining group size dynamics of a given population. The various studies are not always directly comparable because of different survey methods used (ground versus aerial counts) and the lack of a clear definition for a group in some cases. Group size data may also be represented by the average size or by the frequency distribution of sizes. Only matriarchal groups are considered here. The largest elephant group sizes observed are in African savanna populations, such as in East Africa (fig. 4.19). Mean group sizes of over 10 individuals have been commonly recorded in several populations. Very large elephant groups, numbering up to several hundred animals, are also seen here at times. Some of these are not cohesive groups, but represent a loose congregation of several elephant groups, which themselves may be quite large. Richard Laws has suggested that the polymodal frequency distribution of elephant group sizes in savanna habitat could reflect the association of the basic mother-offspring units. Group sizes are more typically in the range of 5-10 individuals in African woodland habitats and in Asian dry forests, such as in southern India. Much smaller mean group sizes of fewer than 5 elephants are characteristic of African rain forests (fig. 4.19). The simplest explanation possible for the variation in group size across habitat types is food availability and dispersion. Savannas offer an abundance of green biomass in the form of perennial grasses, especially during the wet months, compared to the rain forests, where food plants—a variety of fruits, palms, climbers, and shrubs—are scarce and widely dispersed. The need to avoid competition and increase foraging efficiency in the rain forest habitat would call for smaller group sizes. Variation between dry season and wet season group sizes within a population also supports the foraging efficiency hypothesis. Walter Leuthold found a consistent positive relationship between rainfall and elephant mean group size during 1965-1973 at Tsavo National Park. 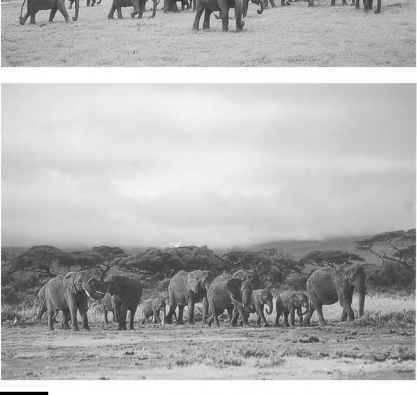 Likewise, at Amboseli, David Western and Keith Lindsay observed that elephant herd sizes during 1973-1979 spontaneously increased with the onset of rains and progressively declined through the dry months. A comparison of seasonal group size distributions here during 1985 by Joyce Poole and Cynthia Moss showed that group sizes larger than about 85 elephants were seen only during the wet months. Other explanations are also possible for variation in elephant group size. Elephants are social animals, and the unit social groups may tend to associate among themselves whenever they meet. Thus, higher elephant density, either in preferred habitat within the range of a population or across the distributional range (savanna versus rain forest), could promote larger group sizes. Richard Laws thus found, in North Bunyoro, Uganda, that elephant groups were larger in regions of higher density, but that group sizes did not necessarily vary with season. This is also implicit in Natarajan Ishwaran's observation that Asian elephant group sizes were larger in a Sri Lankan population with a range that had contracted in comparison to another population. compared to the first wet season (5.8). My explanation was that elephants tend to congregate at higher densities near water sources within preferred habitat during the dry months, thereby increasing the chances of intergroup contact and association. Their dispersal over a wider area with the onset of the first rains reduced social contact and group sizes. The largest elephant groups were observed during the second wet season, when variability was also the highest. The larger group sizes during the second wet period occurred partly from aggregation of families for movement to lower elevation scrub habitat. Western and Lindsay also observed that the large aggregations of Amboseli elephants occurred immediately following the rains, when food was still scarce, presumably for movement to bushland habitat. Anecdotal accounts of large elephant groups undertaking long-distance migration lend further support to this contention. Another interesting pattern of group dynamics can be observed in the Nagarahole-Bandipur Reserves of southern India. Elephant groups here begin to frequent the banks of the Kabini Reservoir during the late dry season. The proximate attraction seems to be in part water as well as short grasses that grow along the banks when the reservoir recedes. However, this period is also turned into an opportunity for social interactions among the elephant groups, which can now get quite large. The congregations persist through the premon-soon period, but break up with the arrival of heavy monsoonal rains. A final point to be considered is that increased group size in elephants is a response to threats from natural predators or humans. The larger group sizes in habitats such as African savannas or Asian forests that harbor the larger predators (the lion and the tiger, respectively) broadly supports this expectation. 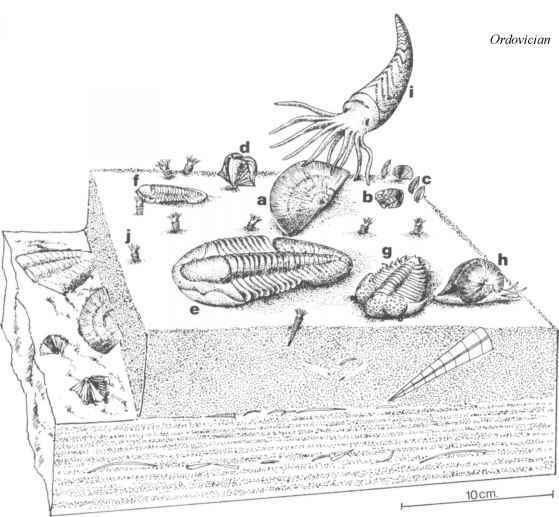 However, it is difficult to tease out the extent to which antipredatory response influences group size as opposed to other factors, such as food dispersion. The tendency for elephants under hunting pressure to aggregate has also been noticed in East African populations. Uganda's Queen Elizabeth (Rwenzori) National Park suffered heavily from poaching during the 1970s and 1980s. The mean group size of female herds increased from 5.9 in 1963-1965 to 10.8 by 1976, when Keith Eltringham observed a positive relationship between group size and poaching pressure in different areas of the park. More than a decade later, Eve Abe found that the elephants here had aggregated into two large semipermanent groups. Because poaching had eliminated the older matriarchs, this behavior could have been due to leaderless herds coming together for safety and social needs. In Tanzania's Mikumi National Park, however, a dry season survey in 1992 by K. F. Anderson and S. K. Eltringham did not find any evidence for stress-related aggregation of elephants in spite of poaching pressure and lack of older matriarchs. Thus, elephant groups are not merely random associations of the basic units, but form as a response to specific circumstances and needs. These could be social needs, such as networking among individuals or groups, reinforcing bonds between related members, mating opportunities, or even resource acqui sition by kin groups, possibly in addition to seeking safety from predatory or poaching threats. A complex trade-off between these social factors and foraging efficiency in relation to food dispersion could determine elephant group dynamics in a given population.